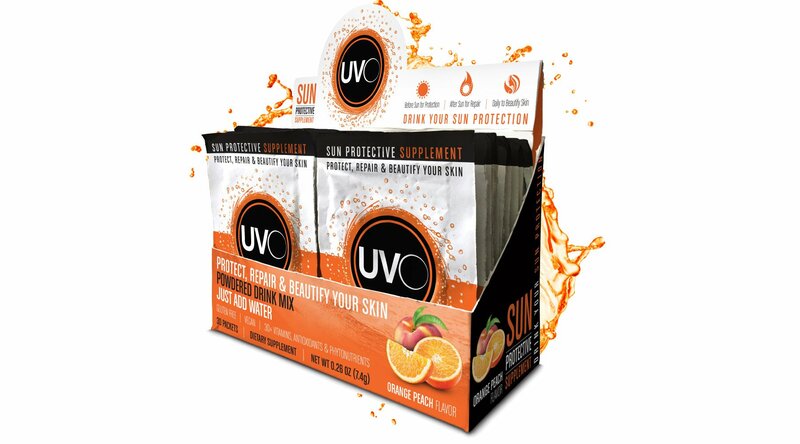 UVO helps protect, repair and beautify your skin from the inside out. Beta Carotene, Ascorbic Acid, Cholecalciferol, Alpha-Tocopherol Acetate, Niacinamide, Folate, Biotin, Zinc, Selenium, Copper, Polypodium Leucotomos Extract, Milk Thistle Seed Extract, Ginkgo Biloba Extract, Alpha Lipoic Acid, Citrus Bioflavonoid Complex, Grape Seed Extract, Coenzyme Q10, EGCG, Lutein, Lycopene, Resveratrol, Zeaxanthin, Bilberry Fruit, Sugar (Cane), Natural Flavors, Citric Acid, and Stevia Leaf Extract (Rebaudioside A). Add 1 packet to at least 8 oz of water or drink of your choice. Dilute to taste and stir or shake vigorously. Single Use: Drink 30 minutes before sun exposure, or immediately after sun exposure. Daily Use: Provides maximum skin benefits.